The United States Congress designated the New Water Mountains Wilderness (map) in 1990 and it now has a total of 24,600 acres. 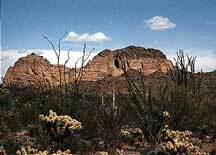 All of this wilderness is located in Arizona and is managed by the Bureau of Land Management. The New Water Mountains Wilderness is bordered by the Kofa Wilderness to the south and the Kofa Wilderness to the south. Despite its name, this land of colorful craggy spires, sharp ridges, sheer rock outcrops, natural arches, and slickrock canyons receives less than five inches of rainfall annually, so you should pack in your own water. Bordered on the south by Kofa Wilderness and on the north by Interstate 10, New Water Mountains offers great backpacking. About 20 primitive, two-track trails can be easily followed on foot. Black Mesa, a large volcanic butte, stands in the northwest corner 1,200 feet above the Ranegras Plain and 3,639 feet above sea level, the highest point in the Wilderness. Vegetation is sparse. Saguaro, creosote, ocotillo, and cholla dot the hills, and paloverde and ironwood line the washes. New Water and Dripping Springs are prime lambing areas for desert bighorn sheep. Hunters track sheep and mule deer here. Planning to Visit the New Water Mountains Wilderness? How to follow the seven standard Leave No Trace principles differs in different parts of the country (desert vs. Rocky Mountains). Click on any of the principles listed below to learn more about how they apply in the New Water Mountains Wilderness.